I have been asked a number of times about some of the Modifier with Visual Basic for Applications (VBA) customizations featured on my blog and those over at Developing for Dynamics GP. It's no secret that I co-author a number of development posts with my friend David Musgrave in the spirit of educating and delivering some of the best articles to the end-user and development communities alike. In light of this, this week I will deliver a 3-day Online Modifier with Visual Basic for Applications workshop, featured right here on this blog, that will step through a real-life customization from end to end. For the workshop, you will need a registered copy of Microsoft Dynamics GP v10, the Fabrikam sample company, and familiarity with the overall Dynamics GP navigation. Named Printers is a module to allow controlling of the printer and settings used when printing reports. It was originally developed for v3.00 by me while I was working for Sequel Technology (that's why the tables and calls are prefixed with ST). Later it was purchased by Great Plains for v5.50 and included in core code (Dynamics.dic) for v6.00 onwards. #1-Login to GP as SA. Well you learn something new every day and today our tame Dex developer is sat next to me in the office (some say he writes code in his sleep, others say he has dexterity tattooed on his heart, all we know is, he is called Jon) so picking up all sorts of things. However, this one is worth giving away as I have seen many users request this feature to speed up data entry and processing. 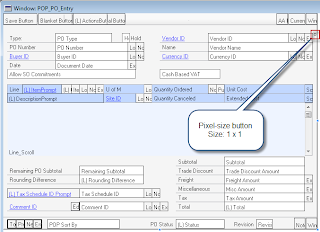 Take for example the Purchase Order Entry window. Won't you just like the ability to press some combination of keys on your keyboard to quickly access the Vendor Detail Entry window where you can quickly change around shipping methods, or other information needed? Well this example shows just that, but can be used to add shortcuts to any other button control in any other Dynamics GP window. 1) Add a pixel size button to the window with Modifier. Welcome to the first installment of this 3-day workshop! The workshop will be conducted today Monday, Wednesday, and Friday. The format is simple: get your laptop or PC with Dynamics GP 10.0 and follow the instructions below. Try to complete each section of the workshop and post your questions. That's it! The Equipment Maitenance window will require a new field, the Regulatory Entity, and a new Lookup button that will call our Customer Lookup window. 1) Open the Equipment Maintenance window. Go to Cards > Field Service > Equipment. Why can't I maximize my window? What does Option Explicit do in VBA? With password policies in place in Dynamics 10.0 RTM, it was easy to be able for your user to 'lock themselves out' after a mistyped password or two. Because Dynamics GP doesn't give you any kind of warning that the Caps Lock key is enabled, the user wouldn't necessarily notice this is the real issue and not a typo and all of a sudden you are locked out. With 10.0 SP2 and the change on how Dexterity/GP tries to login; this is less of a challenge but it still is possible for the user to lock themselves out of Dynamics GP because they left the Caps Lock key on. The final topic in the series is one that was added later after I was asked about how to handle translated applications when writing customizations. Most code would work fine as it is independent of the language. However, it is common in Visual Basic for Applications (VBA) customizations to read the prompt from a dialog using the Window_AfterModalDialog() event and take action based on the prompt text. On a translated system this text will differ. Microsoft Dynamics GP uses concurrent licensing which provides for a maximum number of users logged into the system at any one time. Each time a user logs into a company, one license is used. Welcome to the second day of our Modifier with Visual Basic for Applications (VBA) workshop! In the previous session we added some extra controls (a field, a lookup button, and a zoom button) to the Equipment Maintenance window. We also explored linking the field to its prompt and the lookup to its field. This is especially important if we want to provide some extra capabilities to our project. After all, you never know who will customize our customization. For more information check my previous article "The importance of linking your fields to their prompts. 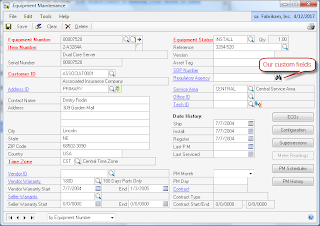 For our project, we will need to add the Equipment Maintenance window to VBA, along with the controls we created. In addition, we will need to have our lookup button call the Customer Lookup window in the SmartList dictionary. This means that we will also need to add this window to the VBA project. 2) From the window Tools menu, select Customize > Add Current Window to Visual Basic. I am also a fan of shortcuts, so you could have also pressed CTRL + F11 on your keyboard. Now you have added your window to VBA... very simple!